The RSXM12A produces 800 watts of Class D power via its respective 12" low frequency driver and premium 1” horn-loaded tweeter. 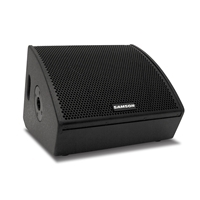 A compact, coaxial design gives the monitor amazing portability with impeccable sound. In addition, the RSXM12A has an integrated 1 3/8" pole mount receptacle and a Monitor/FOH optimization switch for added flexibility. Designed to bring professional performance to a variety of monitoring applications, including keyboards and electronic drums, the RSXM12A is also convenient for DJs needing a dedicated monitor while working in a compact booth. A single XLR-1/4" combo input is provided, along with an XLR Link output for system expansion. In addition, the RSXM12A includes a powder coated steel grill and two integrated side carry handles, making it durable, yet highly portable for use on the road.